You might (or might not) be familiar with Surface Crochet – it’s a great way to add interest and embellishments to a project. 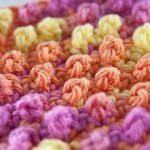 Surface Single Crochet is similar – but it can also be the jumping off point for something more! Try this technique in Bring Your Own Bag or Ella the Elephant Lovey! 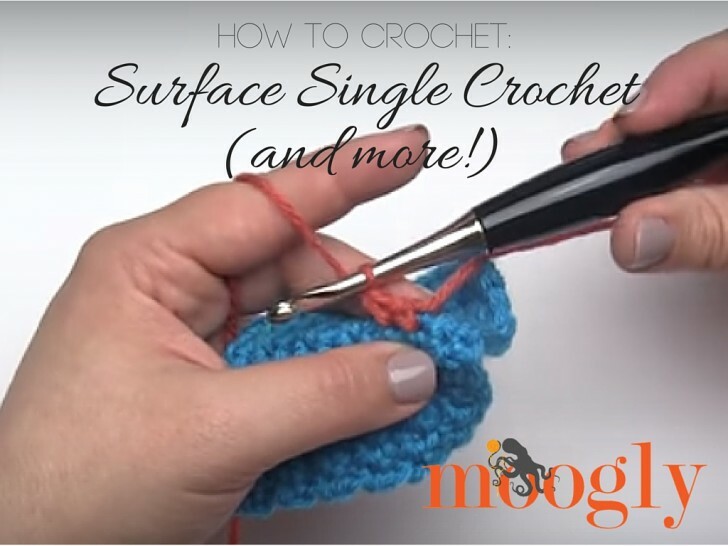 To make a Surface Single Crochet, you work from the side of the project indicated in the pattern – it might be the right side, or the wrong side, it just depends on why you’re making it. With a slip knot already on your hook, take the piece of crochet you want to add to, and insert the hook around the stitch as for a post stitch. It could be any part of the stitch – the post, the part where the top and bottoms of the rows meet – but the point is to go in a hole in the fabric and come back out in the next hole that’s in the direction you want to travel. Then yarn over, pull that loop through, and finish the single crochet as usual. To make the next Surface Single Crochet, go into the same hole as the one the hook came up through in the previous stitch, and come up in the next hole in the direction you’re going… and keep going until you’ve reached your end point! Once you’ve reached the end of your new Surface Single Crochet row, you can break the yarn, or turn and go back and forth along this new line in rows… whatever your pattern calls for! Why would you use this stitch? It could be a super 3D embellishment, like a beefier standard surface crochet stitch, or it can be a very useful jumping off point! For instance, in the Ella the Elephant Lovey pattern, we have an amigurumi elephant head waiting to have a blanket attached. By crocheting a round of Surface Single Crochet stitches, you have a set of stitches ready to start crocheting the blanket into! In the Bring Your Own Bag pattern, Surface Single Crochet is used to create a grid that is then crocheted into to make the dividers that keep the bottles apart – the part that turns a rectangular bag into a 6 pack carrier. 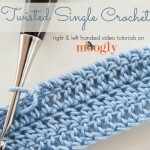 You can do all sorts of things with this technique – and there’s nothing saying it has to be single crochet stitches either. You could absolutely make Surface Half Double Crochet or Surface Double Crochet stitches – just yarn over before you insert the hook! This is a pretty unique technique, but I hope you can see how it can help you create even more 3D projects – it’s full of possibilities! And I hope you enjoyed this video – thanks for watching! Get Moogly on your favorite social media sites: Facebook, Twitter, G+, Pinterest, Instagram and Tumblr, and sign up for the free Newsletter so you don’t miss a thing! Thank you to Lion Brand yarn and Furls Fiberarts for the products used in this tutorial.